A State of Freedom is published in July 2017 by Chatto & Windus, and in the USA in January 2018 by W.W. Norton & Company. “Neel Mukherjee’s breathtaking A State of Freedom is that rarest, most wonderful of things: a book both literarily dextrous, full of unforgettable scenes, images, language, and characters, as well as a furious, unsparing, clear-eyed study of how a society’s gross inequities of money and power demean and deform the human condition. The most astonishing and brilliant novel I have read in a long, long time.” — Hanya Yanagihara. “An extraordinary, compassionate, complex, hard-hitting wonder of a book. It is in a class of its own.” — Rose Tremain. “A State of Freedom is an extraordinary achievement. Subtle and multi-layered, it’s a study of the brutality of social divisions, written with tremendous tenderness; a work that insists on the dignity of figures obliged to lead undignified lives. A powerful, troubling novel. The moment I finished it, I began it again.” — Sarah Waters. “This is a great hymn to poor, scabby humanity―a devastating portrait of poverty and the inhumanity of the rich to the poor. A masterpiece.” — Edmund White. “Fans of Neel Mukherjee expect that his books will be exceptional and once again he has produced just that. A State of Freedom is formally audacious, vividly observed, and deeply imagined. Unsentimental yet full of heart, grimly real yet mysteriously dreamlike, with characters who continue to live their complicated lives long after you’ve turned the last page. Just a beautiful, beautiful piece of work.” — Karen Joy Fowler. 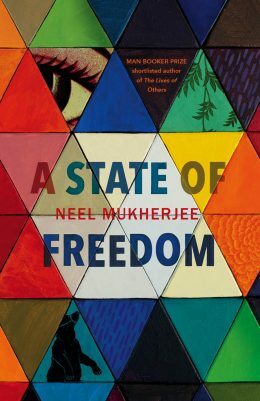 “Neel Mukherjee’s A State of Freedom is a novel like no other — its prose is so rich, unequivocally precise and graceful that it allows Mukherjee to illustrate the most horrific of experiences with stunning compassion. A State of Freedom is more than a novel—it is an immersive experience. He writes like a painter, his language is his palette, one reminiscent of the late Howard Hodgkin’s. Mukherjee brings to life the variation of India’s cities and towns in a dense multi-layered world where modern life, by accident or intention, tears at traditions that are centuries old. Throughout we are reminded of how little power many have over their lives and of emotional and financial economies so fragile that something as small as a single egg can carry great weight.” — A.M. Homes.